The article quotes an unnamed folk source as saying, "You can't keep a good man down, especially when he runs an elevator for a living." 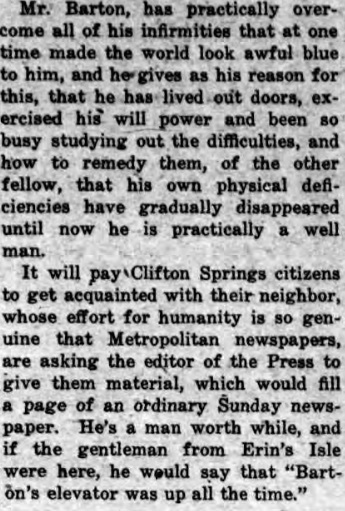 The newspaper editor goes on to state "and in no instance has the editor found opportunity to apply this witicism, where it was found more appropriate than in the introduction of George Edward Barton, A.I.A., a resident of this village, who is known by many, and who but few, really know." Barton's disability is described in detail, as is his effort to overcome those difficulties and help other people. 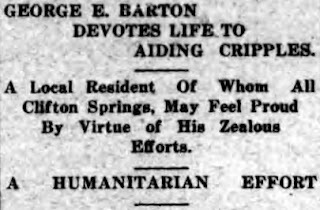 We all look forward to the rescheduled celebration of George Barton and his efforts in Clifton Springs that founded the occupational therapy profession. "You can't keep a good event down!"